Please Note: This package can only be sold to the UK and Europe due to the free warranty offered with the ultimate package. Camping World's Ultimate Packages contain some of the most popular items bought with the Nevada 5P Tent. 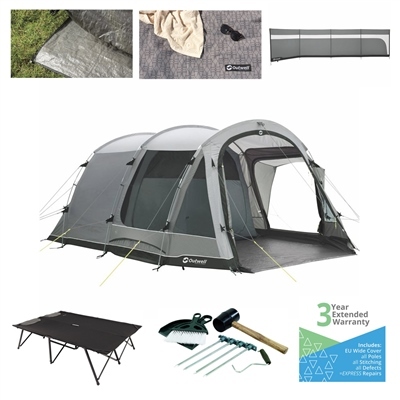 The Ultimate Package is designed to make shopping as easy as possible for your dream tent. Not only this, our Ultimate Packages save you money and come with increased security with our 3 YEAR EXTENDED WARRANTY! Sleeping five in a three-room tunnel tent with two Ambassador Master Bedrooms, the Nevada 5P offers flexible camping for families and friends with generous living space for relaxing. Pre-shaped poles deliver stability, full headroom and steep walls for maximum internal space. With many windows, Rain Safe side door with canopy and ample ventilation, it’s a cosy home from home. A good night’s sleep is essential in making the most of any camping holiday and the Outwell Foldable Bed range offers easily erected, stable, sturdy designs that raise the bar in sleep comfort for the whole family. All have smart patterns to lift bedroom atmosphere and pack away neatly. The new Pardelas M and Pardelas L designs enjoy super comfortable padding, a detachable pillow and a padded frame cover to extend comfort. Both have a hook and loop strap to keep the bed folded for transport and storage. All Posadas Foldaway Beds – Single, Double and XL – now have an elastic band to secure a mattress in position. They also have a padded cushion with soft mesh to keep you cool and ventilated. Double the relaxation, double the fun! Sunbathe together with the two person Posadas Foldaway Bed. Padded soft mesh cushions increase airflow keeping you cooler in the heat. While the high strength frame offers comfortable support from top to toe. Opening and folding in seconds, it comes ready for use in its own compact carry bag. Can also be used for night-time sleeping. This handy Tent Tool Kit from Outwell is the perfect camping tool kit to take on your camping trip. It makes light work of pitching your tent having your much needed tools in one practical kit. You will find a rubber mallet, 4 steel 25cm pegs for tough ground, a peg extractor and a compact dustpan and brush for keeping your tent tidy. Pegs, poles, rings and guylines are the mortar that holds the bricks of happy camp life together. Securely pitching tents is essential for comfort so packing a few spares to cope with accidents, wear and tear is a sensible precaution for even the most experienced campers. Our range of hammers, mallets and peg extractors makes short work of pitching and packing away avoiding frustration with the right tool for the job. Our exclusive extended warranty covers any and all products purchased with this policy. Whether you buy 1 or 100 products from us, all items are covered by one policy. As a holder of a Camping World extended warranty you can expect priority treatment, a named claims handler and the fastest possible resolution to any problem you face. For repairs, we will ensure an expedited process and where a replacement item is deemed appropriate, we will aim to get that replacement to you anywhere in Europe within 7 days*. Most manufactures will provide a basic warranty as standard, however these can range from 30 days to 12 months and after 6 months the responsibility is on the buyer to prove a fault was present at the point of manufacture. Camping World warranties last a minimum of 3 years and cover much more than any standard manufacturer warranty on the market. What's more, you don't have to go through the manufacturer's sometimes-lengthy warranty procedure for claims.